Watt's Up? 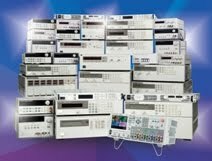 : How much AC power do you need to support your DC output? How much AC power do you need to support your DC output? Overhead power loss– this is the power consumed by the power supply that is not directly related to the output power conversion. It is the amount of power consumed by the internal circuits that are needed just to provide the basic internal functions of the power supply, such as front panel display control, internal bias supplies, cooling fans, and microprocessor control. This power is dissipated as heat inside the power supply and is therefore not available to flow to the output. Some of this power is consumed even when the output is providing no power. Power conversion loss – this is the power lost in the power conversion circuitry. All of the output power flows through the power conversion circuitry, but as it does so, some heat is generated. The power lost as heat is not available to flow to the output. A power supply’s efficiency is typically specified at the maximum output power point and includes losses associated with both the overhead power and power conversion circuitry. Most power supply vendors will publish the maximum expected AC input current, watts, and/or volt-amperes for their products so you should be able to get this information from the vendor’s documentation. But let’s consider an example based just on the output power rating and efficiency. 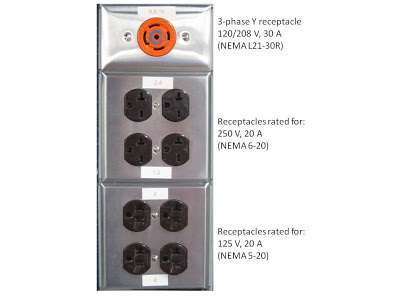 Use a less-common receptacle (outlet) and plug rated for more than 20 A. Have an electrician hard-wire the AC input connection to the AC mains ensuring the wires and AC mains branch circuit can handle the higher current (no outlet would be used). If the power supply is rated for it, power the power supply from a higher AC input voltage, such as 208 Vac or 240 Vac to reduce the current required. This solution will also require a less-common receptacle and plug (middle receptacles in photo). Many very high-power supplies (a few kW and above) require a 3-phase AC input voltage to accommodate the larger amount of output power (orange receptacle shown at top of photo).